I think the little kid inside me is not only alive and well, but tends to guide me through life, only allowing the grown up out occasionally. 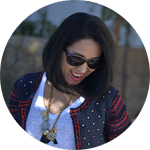 I know it takes the lead sometimes when I’m planning meals, making sure there is plenty of finger food and options that add a joyful atmosphere to each meal. It doesn’t have to be summertime to use this recipe, but your “adult side” would approve, since it won’t heat up the house. 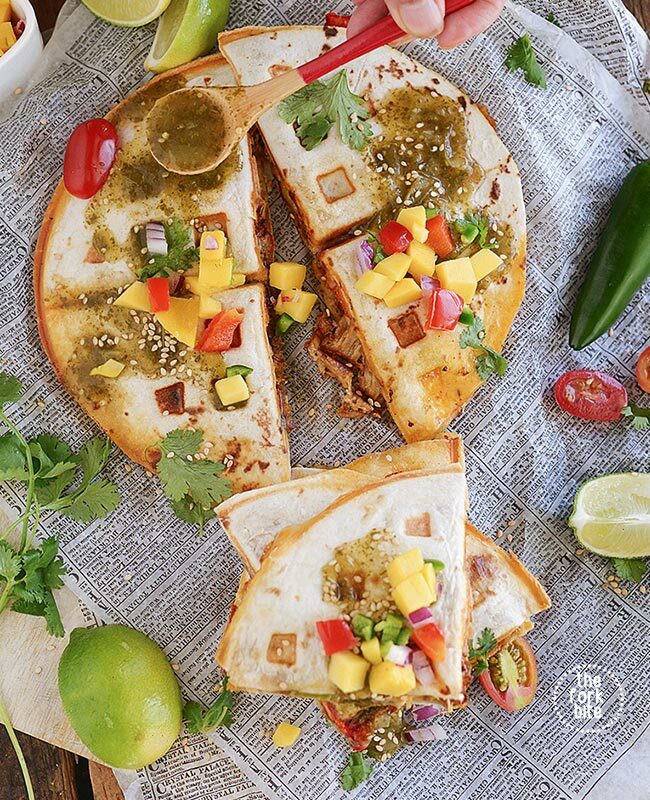 Your child side will love the unique method of making these delectable quesadillas since you use a waffle maker. I got the idea from waffle cones. We were out on a family day and one of the kids mentioned that waffle cones were the best because they were prettier and the bumps in your mouth made them far more fun to eat, just like waffles were more fun than pancakes. That made me stop and think. She was right! They were more fun. So how could I use the waffle maker for more than just waffles? I started with grilled cheese sandwiches and worked my way through 90-second cookies, portable scrambled waffle eggs and finally tried this pork carnitas quesadilla. All of them were fun and delicious, but I had to make seconds and third helpings for everyone on the quesadilla. 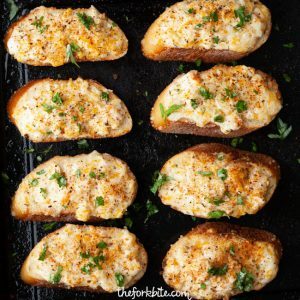 Not only is this recipe easy to make, it’s versatile and melts all the ingredients together perfectly. 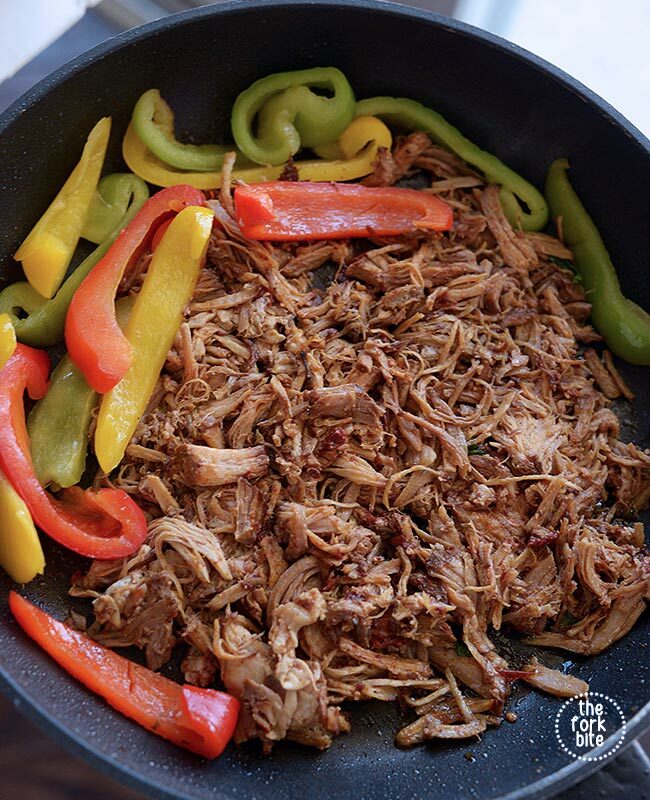 I made the recipe with the pork carnitas, which I froze earlier, but even if I didn’t have it already on hand, I’d still use it since it’s a snap if you have a slow cooker and it tastes so yummy. 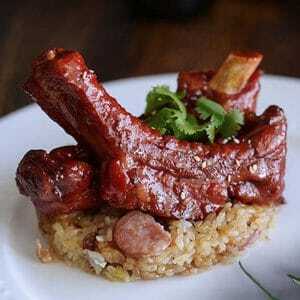 You can make it with other ingredients, such as spicy pork al pastor or even steak. I also gave it a Korean flair with gochuchang, but you can use sriracha or other hot spicy substitutes. The waffle iron makes the outside evenly crispy and crunchy and you don’t have to worry about flipping it while you’re cooking. Not only does it taste great, it’s far more fun and eating should be an experience. Yummers, my mouth is watering just thinking about the quesadilla. Preheat the broiler into high. Line a baking sheet with parchment paper. Add the peeled tomatillos and place under the broiler for 3-5 minutes, until the tomatillos are mostly charred all over. Remove from the oven and let them cool a bit. Throw the charred tomatillos and pineapple chunks to a blender or food processor. Add the sesame oil, rice vinegar, soy sauce, Gochujang or sriracha and lime juice. Blend well. Transfer into a glass container and stir the sesame seeds. The mixture would last for a week if stored in the fridge. Preheat a waffle iron maker. 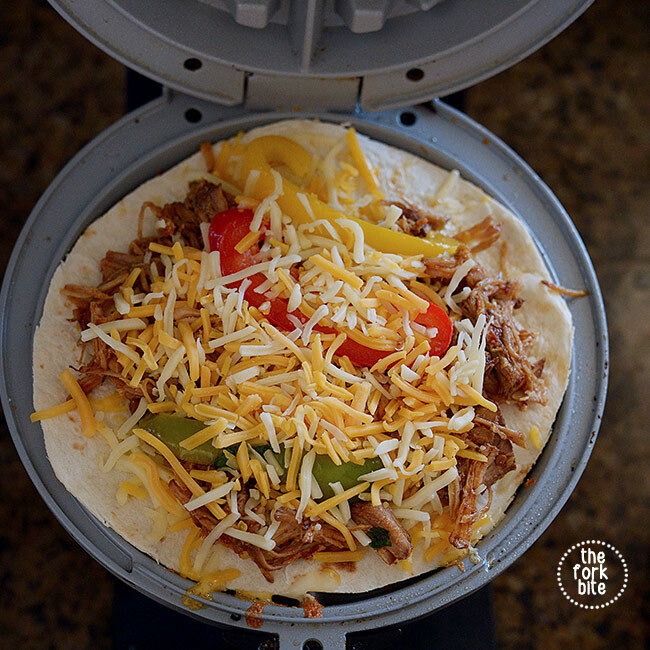 Once preheated, layer one tortilla on the waffle maker and then add a layer of cheese, a layer of pork, a sprinkle of rice and then another layer of cheese. Add the top tortilla and carefully close your waffle iron. Be careful not to overload your quesadilla or your waffle iron will not shut. Cook until lightly golden and browned, approximately 5 minutes. Repeat with the remaining ingredients. Korean Sunchang is a Korean chili paste/sauce you can buy at any Korean market or you can order it thru Amazon. You may also use sriracha or Gochujang (Korean chile paste) as substitute. This quesadilla looks so tempting. I will definitely pinned this. I will try to do this cheese quesadilla recipe. I am pretty sure that my live ones will surely love this. This looks absolutely mouth watering!! I am definitely saving this for our family, we love quesadillas lol. Thank you! Wow! that’s looks mouthwatering! I’m a mexican food lover and that doesn’t help. haha I’m gonna give this a go tomorrow! this looks amazingly delicious! maybe i’ll try these this weekend! Oh this looks so delicious, I would love to try this sometime with some extra tabasco on it. What a brilliant idea! I never thought to use a waffle maker for quesadillas but it looks delicious, fast, and like something I definitely have seconds on. This looks SO yummy, omg! 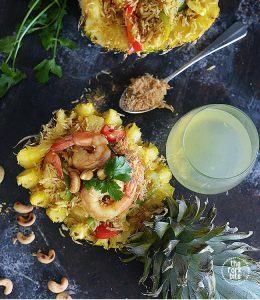 I will definitely have to try this recipe out this coming weekend! This looks amazing and delicious. If it wasn’t everything I was allergic to, I would eat it up! This looks really delicious. Quesadillas have to be one of my favorite foods to get at a restaurant or make at home. I’ll have to save this to make the sauce later. Wow you have given a new look to quesadilla. 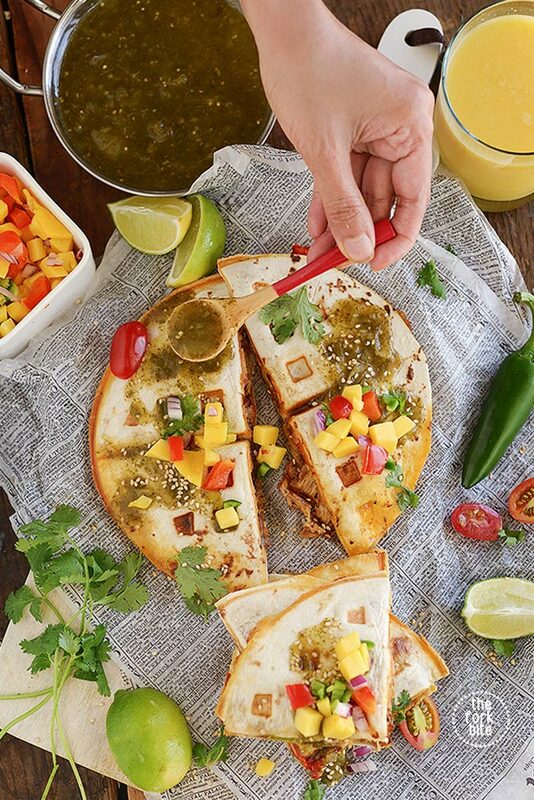 Waffle styled quesadilla is an innovation and I would surely try out this. Now I am getting so many ideas. Thanks for sharing this super innovative idea. These look so good’! I love quesadillas. I wouldn’t have thought to use my waffle maker for anything else so I’ll be experimenting from now on. I’m taking note very carefully ! This is such a smart idea! 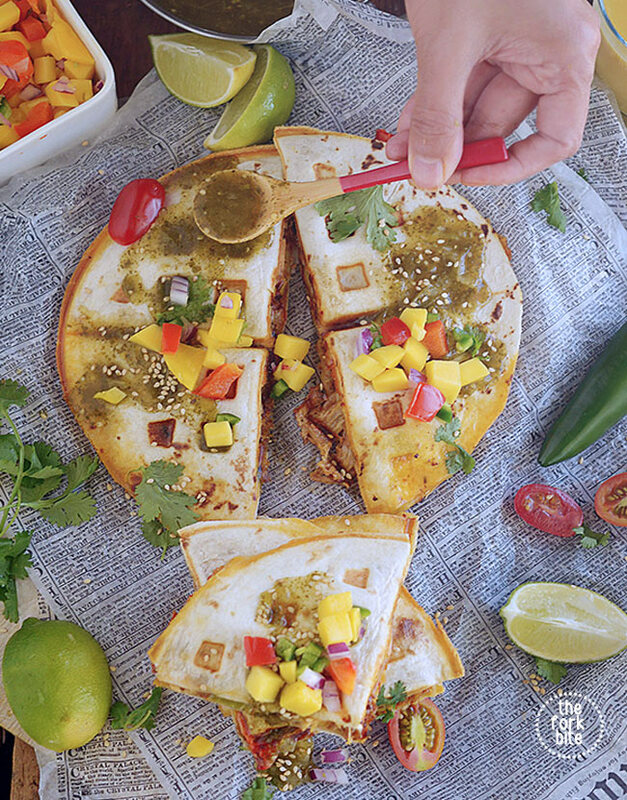 Now I can make use of our waffle iron for other things, especially this quesadilla recipe! I can’t wait to make it. Yummy! I love everything about your recipe! Hubby loves everything Mexican cuisine based and I love finding good recipes like yours! Thank you for sharing! You did a wonderful job with this quesadilla! I love how you topped it with extra ingredients to make it even more pretty! This is such a great idea! I’m definitely trying this with my waffle maker! I’m also going to do the grilled cheese sandwich suggestion too. I am a lover of Mexican food and I really love quesadillas. Yum. I need to try this recipe out. That looks delicious. This would a perfect dinner. 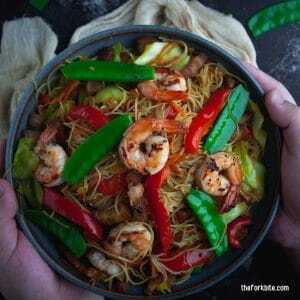 I love this full of flavour, thank you for sharing this recipe. I never would have thought to use a waffle maker for a quesadilla. Brilliant! That looks absolutely delicious. And I love your idea of making them in a waffle maker. I love the idea of using a waffle iron for quesadillas! I have one sitting in my cupboard and, because pancakes are quicker, we never really make waffles. I tried grilled cheese in my waffle iron once and it was pretty good 🙂 This is definitely up next on the list as the cooler weather sets in and I start digging out my hoards of cooking utensils/appliances again! The first thing I will do tomorrow morning is to buy a waffle machine! 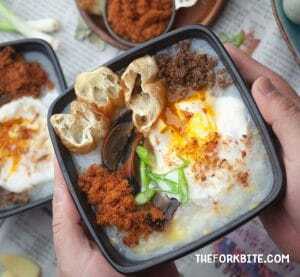 And then make thia for lunch! It does look very fun with all the colors! Yummy! Wow, this looks so tasty! I have never made anything similar, but I think I’ll make this. My family will surely enjoy it! 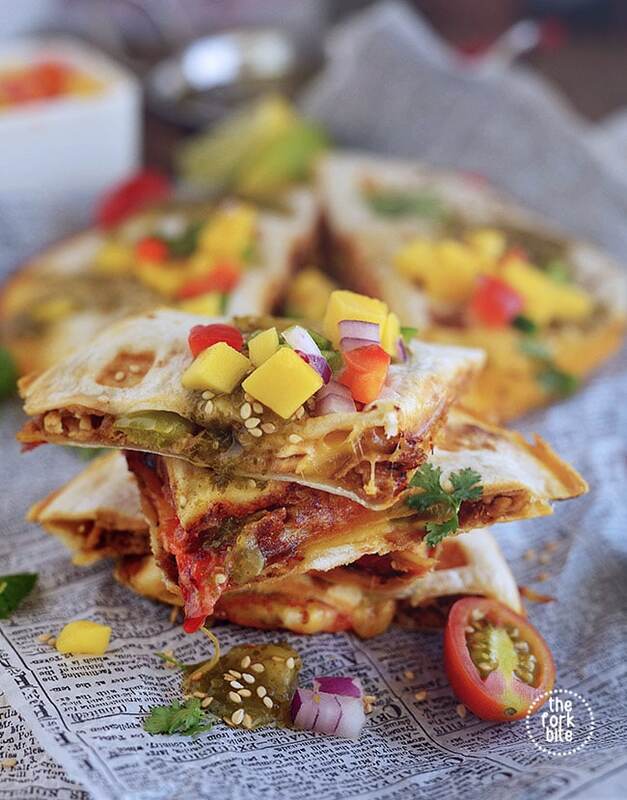 This quesadilla recipe looks yummilcious! I love the use of the waffle maker – such a great idea! Why haven’t I thought of that? It certainly makes a perfect quesadilla! Looks tasty.. will try to cook it. This looks so yummy!! I love how you have expanded the use of a waffle maker. Rarely use mine because it’s so big and has only one use, now I can pull it out and make so many fun dishes. You can add anything you want for a quesadilla. That is sucj a cool idea! I am definitely going to try that! Can chicken be used as well? We like quick and simple meals like this. The salsa is perfect. Fab idea to make these in a waffle iron. Quesadillas make such a great family meal. Love your addition of gochuchang. What fun to make them in a waffle iron! Great photos! Love this whole idea! What a cool idea to use your waffle iron to make these, makes them easier and more fun like you say! These are absolutely brilliant, I’m plugging in my waffle iron now!! Genius! This covers my adult and child side! I can’t wait to try making quesadillas in a waffle iron! How fun! I love how the grooves are perfect for holding extra sauce. My family would absolutely love these. So easy too.